Last weekend, East Coast Throwdown brought fighting game competition back to New Jersey with its ninth installment. As one of the last tournaments before the release of Marvel vs. Capcom: Infinite later this month, the event featured a stacked Ultimate Marvel vs. Capcom 3 bracket that showcased a clear endpoint to the game’s strategy. Evo 2016 champion Christopher “NYChrisG” Gonzalez found himself among the finalists, but ultimately met his match when he faced someone fielding the same team he plays. Although generally regarded as an American-dominated series, Ultimate Marvel vs. Capcom 3 has seen its fair share of talent from the eastern hemisphere. Fukumoto previously found success at Evo 2015, where he placed seventh, but came into East Coast Throwdown with a lot to prove after failing to make a splash elsewhere. By the time he reached his losers finals match against Gonzalez, however, Fukumoto had defeated a handful of notable players, including Lincoln “Dragongod” Morris, Armando “Angelic” Mejia, and Evo 2017 finalist David “NoLife” Santiago. The bout between Gonzalez and Fukumoto started out exactly as viewers expected: with lots and lots of fireballs. In high-level play, competitors utilize Morrigan’s flying abilities to fill the screen with projectiles, which become even more intense when her Astral Vision super doubles the amount of plasma hurtling through the air. While both players had a challenging time gaining any ground in the Morrigan mirror, it became clear that Fukumoto had the upper hand when it came to his other two characters. Doctor Doom and Vergil form a competent shell in Ultimate Marvel vs. Capcom 3 thanks to their respective strengths. Where the former excels as a backup character, interrupting any sort of offense the opponent can muster with his annoying Hidden Missiles assist, the latter is typically used as an anchor character that can rip through a team after activating X-Factor, the game’s powered up comeback mechanic. By combining the two, Fukumoto was able to switch out his point character when things looked grim and lock down the opposing team, even in the face of Gonzalez’ overwhelming Morrigan assault. Fukumoto quickly forced Gonzalez into the corner, going up 2-0 in the set. At times, the Evo champion looked lost, unable to mount any sort of offense without getting tagged by a stray fireball or sword slash. In the third game, however, Gonzalez found opportunities to implement his typical gameplan by keeping Fukumoto at bay with a mixture of projectiles from both Morrigan and Doctor Doom. 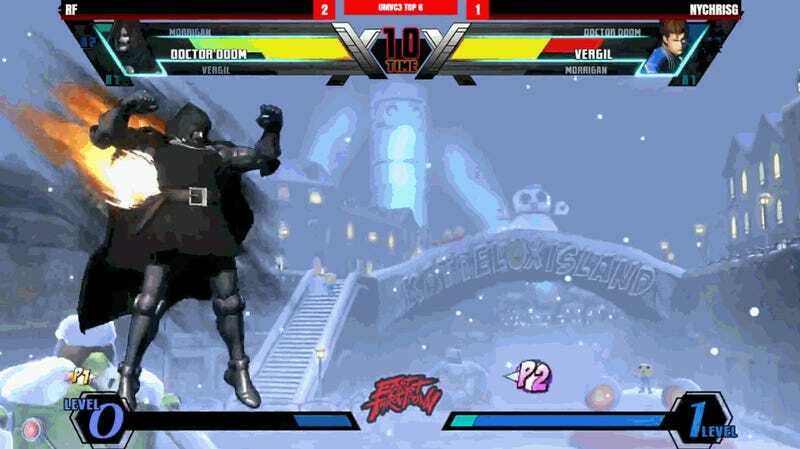 When the Japanese competitor saw fit to sit back with his own Doctor Doom, Gonzalez made the switch to Vergil, closing out the game despite some sloppy play. Unfortunately for the Evo champ, in the end, it all came down to Fukumoto’s brilliant ability to negate whatever strategy he tried to implement. Things looked grim when Gonzalez capitalized on an errant character switch, popping X-Factor to eliminate Fukumoto’s Vergil, but the Japanese player was able to stay in the game thanks to his competent Doctor Doom. Far from just an assist character, Fukumoto’s Doom survived a vicious offensive, allowing him to switch out for Morrigan and reestablish her frustrating zoning game. One character down with more than half the match gone, Fukumoto began his comeback by tagging Gonzalez’ Morrigan with his own, eliminating a potent threat on the opposing team. A quick follow-up kill swung the match firmly in Fukumoto’s favor in just a few seconds’ time, leaving Gonzalez’ Vergil at the mercy of Morrigan and Doctor Doom. As the match came to a close, both players dropped key combos, but it would be Fukumoto who clutched out the victory, defeating the former Evo champion by a score of 3-1. As what would ultimately be the final combo depleted the rest of his character’s life, Gonzalez opted to speed things up by pausing the game and congratulating Fukumoto on the intense match. Fighting game mirror matches can be super tricky. Where normally you’re able to tailor your character’s strengths against the opponent’s, facing the exact same character throws all that for a loop. And while the concept is fairly rare in Marvel vs. Capcom due to the sheer number of team compositions and assist types players are able to choose from, this losers finals match from East Coast Throwdown shows just how difficult it can be to counter your team, even as a former Evo champion. After sending Gonzalez home in third place, Fukumoto moved on to grand finals to face Cole “Flux” Tocci. Despite resetting the bracket, his trip to the United States ended with a second-place finish. For more Ultimate Marvel vs. Capcom 3 competition from East Coast Throwdown, check out the entire finals archive on YouTube courtesy of Team Spooky.